Welcome another weekly summery on famous anime voice actors, aka seiyus. 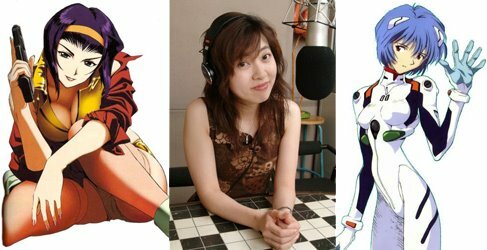 This week I've finally posted a non-gaijin Seiyu and most probably the most famous of them all, Ms. Megumi Hayashibara. Hayashibara was born on March 30th, 1967 in the Kita (northern) part of Tokyo, Japan. As you can see from the mini-picture collage I made of her, her most famous roles are that of Rei Ayanami from Neon Genesis Evangelion and Faye Valentine from Cowboy Bebop. Other roles she has done voices for include Musashi (Jessie) from Pokemon, Haruka Urashima from Love Hina, and female Ranma Saotome from Ranma 1/2. Ms. Hayashibara is also a famous singer with many of her songs becoming major hits in Japan. Most recently she did the Slayers MEGUMIX CD, so she also does the music for some anime titles. She is also the host of Tokyo Boogie Night and Heartful Station, two very popular radio stations in Japan that also with feature works from other Seiyu. On top of that she even has an autobiographical Manga called Ashita ga aru sa, aka Megumi-Toons. In short, she by far lives the dream of many otaku. if you can read Japanese, check out her website here. I actually had no idea who she was until a friend mentioned her to me, and I took a list of her roles on ANN. Watched none of the shows she did, but she was Blanc Neige in the Japanese rendition of Shining Tears (the game), and later Blanc Neige's seiyuu was changed to Kawasumi Ayako, no idea why. Great voice actress, that I know, just that her works are not my style.